By now most people have heard of source software. Products like the Android operating system for smart phones and OpenOffice the open source alternative for the Microsoft Office product suite have shown the general public what is possible when the development community maintains software rather than a corporation. Open source software has also made an impact on libraries. Several projects have made significant progress and are making their way into mainstream operation in public libraries. Going beyond basic desktop productivity software such as word processing there are now open source projects for functions such as the integrated library system which is used to manage patron and item data, reserves and bills as well as the online catalog, server and desktop operating systems help desk ticketing systems, self-checkout interfaces and even phone systems. 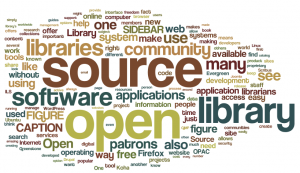 So what is open source? Why is it important? Is it really free? These are very important questions and the last one is very rarely discussed. Open source software simply means that the code used to make the software is available to anyone who wants to see it or change it to better suit their needs. It used to be that large corporations had no hand in open source software however that is quickly changing. Companies such as Oracle and Google have embraced open source software, but that is a subject for another day. Sometimes off the shelf proprietary software just doesn’t do what the organization needs. Open source software is important because it allows organizations to develop custom solution without having to start at square one. Oftentimes needing a custom solution is not unique to the base requirements are the same. An organization can easily use an open source project as their base and develop a custom solution around it. It’s not really free. Open source software does not eliminate costs it transfers cost from the acquisition of software to its customization, maintenance and support. There are many great open source projects that can be used in libraries. One such project is called VuFind. VuFind is an open source catalog develop that Villanova University. The university library there use it as their main catalog. It was so successful that they released into the world and many libraries and library systems use it today. Westchester Library System uses VuFind for the catalog that is used to serve the correctional facilities within the county. There is no Internet access in the libraries in the correctional facilities in Westchester. The WLS IT department modified the VuFind software to provide an offline, standalone catalog that can be used without an Internet connection. To another great example of open source software is Asterisk. This software allows a server to be used as a VOIP PBX phone system. VOIP phone service is significantly cheaper than traditional phone service and using this software allows the library system to save money on its telephone services. WLS is also exploring the use of open source self-checkout software for use in our member libraries. Currently self-checkout solutions are very expensive mainly due to the cost of custom hardware. The solution WLS is pursuing will use less expensive off the shelf hardware along with the open source self-checkout interface to deliver the less expensive alternative to the libraries. Due to the fact that the hardware is off the shelf, ongoing maintenance costs should also be reduced.